I heard hundreds of people yell out 'Do it for Mike' as I ran. As I made my way to the starting line of Monday’s Boston Marathon (accompanied by 22,000-plus of my closest friends), I felt confident that I would finish despite the heat, which topped out at 89 degrees at the halfway point in Wellsley. I never seriously considered taking the Boston Athletic Association up on its offer to defer to next year. By the time I reached “Screech Alley” (the screaming co-eds of Wellsley), I was not at all certain I would make it to the finish at Copley Square. I’d run the first seven miles at a conservative, heat-adjusted pace, then throttled back even more for miles 8 through 13. I drank at every water stop and it wasn’t enough. 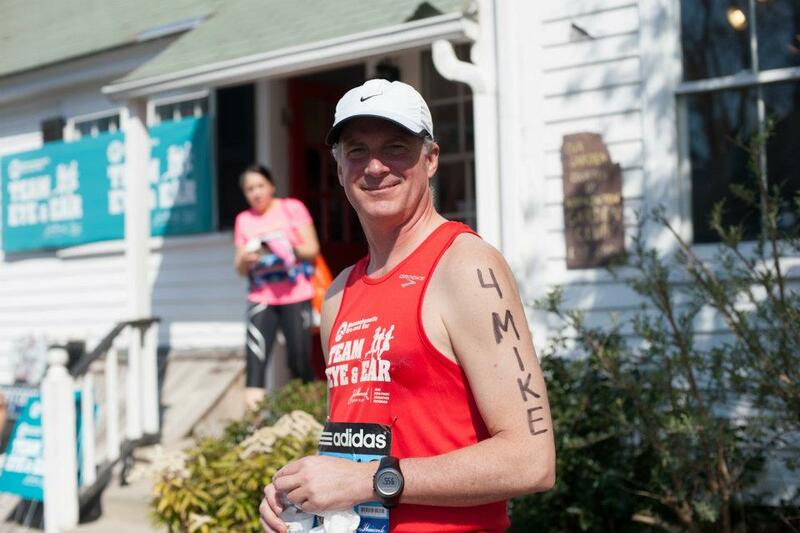 At one point I wasn’t even sure I’d make it to Mile 19, where Cheryl, my brother Tom and his wife Linda and her sister were waiting along with other supporters of Team Eye and Ear. Running 20-milers in sub-freezing temps doesn’t quite prepare you for temps in the 80s. So I focused on the finish and just kept moving forward. I remember turning onto Boylston Street, looking a couple blocks down the street for the finish line and thinking–‘man, that’s still a long way to go.’ Apparently I made it, because somebody handed me a finisher’s medal. So there you go, Mike. Seven years ago this month Mike was fighting for his life at our house. He required a certain amount of help, which he accepted with graceful reluctance. We all took turns doing the various things he needed to ease his pain and provide some measure of comfort, and one of us usually slept in the room with him so we could adjust his meds, get him a drink (root beer! ), go to the bathroom, or massage his swollen legs. Late one night I was asleep on the couch and he called out to me. ‘Jack can you help me up?” he asked. I went over to the hospital bed that hospice had set up for him and helped him sit up. ‘I want to stand up,’ he said. I helped him to his feet and stood facing him. He opened his arms and said ‘Come here.’ I wasn’t sure what he wanted, but stepped forward. He wrapped his arms around me, held me, and said simply, ‘Thank you.’ Then he sat back down on the bed. I’m sure Mike found ways to tell each of us goodbye. I will always treasure that moment. It’s made me more human. And it’s what drove me to run 16.2 miles through the heat from Hopkinton to Boston. Thanks for all the donations, everybody. We raised over $9,000 to fight Ocular Melanoma. Way to go.